This is an absolutely beautiful Ivory silk dress. Perfect for pageants, weddings, or any special occasion! It is hand smocked on the bodice with a delicate diamond pattern. There is a pinned silk bow on the front of the dress on the empire style waistline. The back has covered buttons and a lengthy sash to be tied for a bow. It is sleeveless and the skirt is fully lined. Made of 100% Silk. 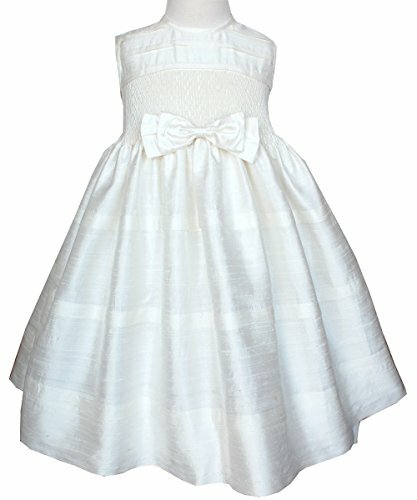 Just the dress you need for your little girl! Perfect dress for Pageants and Interviews or Christening and Communion. Hand smocking and a silk bow adorns the front of the dress. Fully lined and long sash in the back for a bow. Pin tucks above the smocking. If you have any questions about this product by Carouselwear, contact us by completing and submitting the form below. If you are looking for a specif part number, please include it with your message. David's Bridal Flower Girl/Communion Ball Gown Flower Girl/Communion Dress with Heart.